Staff in the Ichthyology Division have contributed to several important field guides in the study of North American freshwater fishes. Florida’s fresh waters are inhabited by 222 species of fishes in 48 families, including 121 native freshwater species, 53 marine species that enter fresh waters from the Atlantic and Gulf of Mexico coasts, and 48 introduced species, including 36 from other countries. Included in this diverse mix of species are three found nowhere else (Seminole Killifish, Flagfish, and Okaloosa Darter), the smallest freshwater fish in North America (Least Killifish), and some of the world’s favorite sport fishes (including Tarpon and Largemouth Bass). 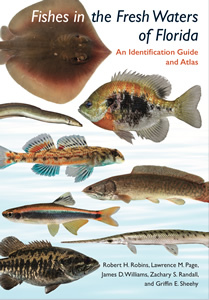 Despite a great interest in Florida’s fishes by generations of wildlife watchers, conservationists, aquarists, sport fishers, ichthyologists, and policy makers, this book is the first comprehensive identification guide to the distinctive assemblage of fishes in Florida’s fresh waters since 1955. High-resolution color photographs and species accounts provide key characters for identification and comparison to similar species, and dot distribution maps created from more than 65,000 museum specimen records, provide authoritative records of species occurrence. Florida’s human population has grown dramatically in recent decades, and the state’s freshwater environments are being altered in ways that negatively affect native fishes and other aquatic organisms. Any effort to monitor and protect Florida’s unique fauna must rely on accurate information concerning the diversity, distribution, and environmental requirements of its native species. This book provides much of the baseline information that is required to monitor changes and make intelligent decisions related to the environmental health of our water and it inhabitants. Sample image: comparison of Longnose Gar from Apalachicola River, St. Johns River drainage and Santa Fe River drainage. 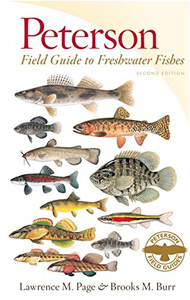 The Peterson Field Guide to Freshwater Fishes of North America North of Mexico is the only field guide to include information on all species of freshwater fishes found in the freshwaters of the United States and Canada. A 2nd edition was prepared by authors Lawrence M. Page (University of Florida Museum of Natural History) and Brooks M. Burr (Southern Illinois University at Carbondale) and became available in 2011. The 1st edition of the guide was published in 1991 and contained accounts for 790 species. The 2nd edition, published 20 years later, contains accounts for about 900 species. Sixty-five of the additional ca. 100 species are newly described or recognized native populations, and 35 are newly established exotics. These dramatic increases reflect changing views on species-level diversity as well as changes in our environment. Many of the newly established exotic species are found in Florida where they thrive in highly modified habitats and threaten the existence of native species. 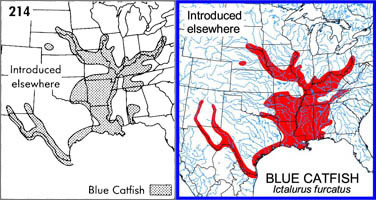 Sample map from first edition (left), and ample map from second edition (right).